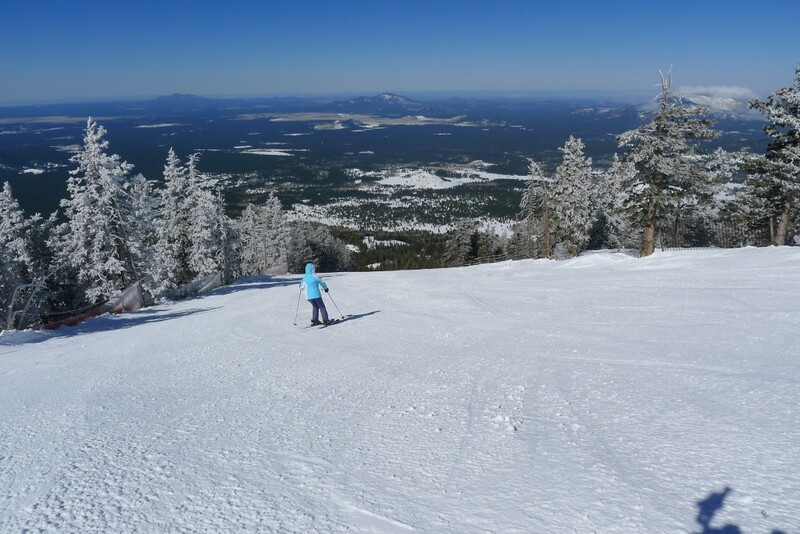 Arizona Snowbowl is one of the two larger Arizona resorts that are candidates for the project. 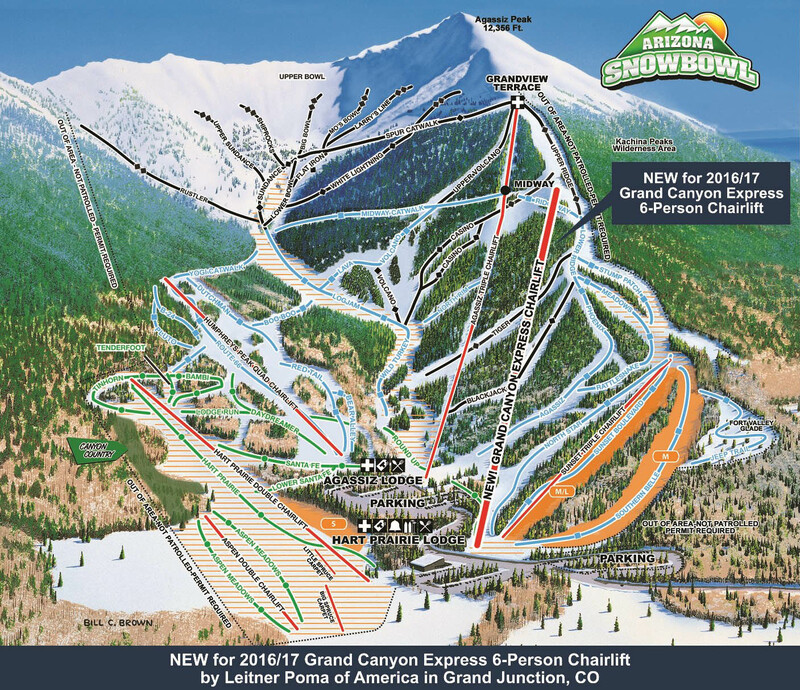 Both qualify on stats, but Snowbowl makes the list because it has a significant consistent vertical, steeps, bowls, views, and a good reputation in the skiing community with dedicated locals. This was the last resort on our tour from Brian Head to Telluride to Purgatory and ending up in Flagstaff. It’s a short drive from Flagstaff on a very windy road up through the forest, somewhat like Ski Santa Fe in New Mexico. This is actually the most southerly resort on our list. We weren’t expecting much because of the location and when you look at the trail map it’s not that impressive, but we were actually very surprised at how great it was. The week before we arrived they had gotten about 3-feet of snow, and the coverage was great with a 77-inch base. Also, after a long battle with the local tribes, they finally were able to install snowmaking recently, so even the lower elevations were well-covered. The resort has one of the largest beginner slopes we’ve ever seen on the lower-left of the trail map. Luckily this is where most of the people were. It was a Friday and in the afternoon a whole bunch of (I’m assuming local) skiers arrived and most of them were renting equipment. The Sunset triple chair at the bottom has mostly been turned into a terrain park, but we did take one run on that lift which was a nice mellow intermediate run as a warmup. 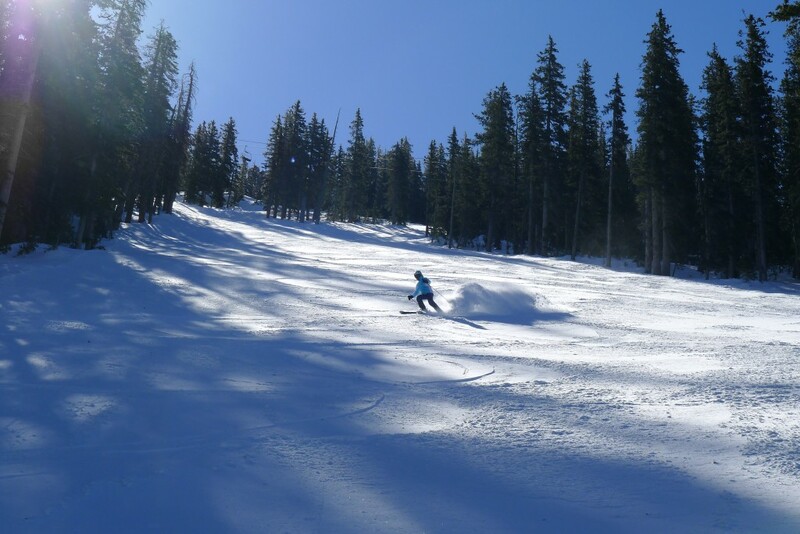 The main action is on the Agassiz Triple chair which starts about 300-ft higher than the base and rises 2000 feet to the top at 11,500 feet. This lift serves a wonderful collection of intermediate and expert terrain. 4 of the black runs were groomed from the top and all of the blue runs were. They do a great job with grooming at this place with visible winch-cat anchors at the top of the steep runs allowing high-angle grooming. We lapped this chair all day and racked up quite a bit of vertical at 2000 ft a pop. One note about the trail map above is that I updated it to the new 2016/17 trail map when Snowbowl came out with it. I noticed that this page is showing up #2 in a google image search and people deserve to see the latest map! When we were there the high speed quad and the Humphrey’s Peak quad were not there. I still feel like the map is a fairly poor depiction of the upper mountain. The runs that fan off the top are all long but on the map they don’t look that way. This almost caused us to scratch it off our list, but I’m glad we didn’t. Strangely, the map the resort was handing out when we were there didn’t even show the Upper Volcano run so they must have been getting rid of some old stock. There is some hike-to terrain off the top above the catwalk that looks interesting. It’s actually a pretty short hike to get up to the ridge top, and we saw some people doing it. However, you need a backcountry permit from the forest service that we didn’t have so that was off the table. I would like to see them open that terrain up to all like most other resorts do these days. The restaurants and lodges are pretty basic with pretty average food, but that is expected in a place like this that serves mostly local skiers. Although we really enjoyed our day there, we gave Snowbowl just a 2-star rating. This is mostly because of the highly variable snowfall that Snowbowl receives. It’s just a bit too far south and often gets cut-off from the storm track for weeks at a time. Although we hit it at a great time, the average is not up to par with other resorts on our list. For example, after February 2nd 2016, only 27″ fell over the next 10+ weeks they were open. The predicted El Nino pattern never happened it it was very dry. 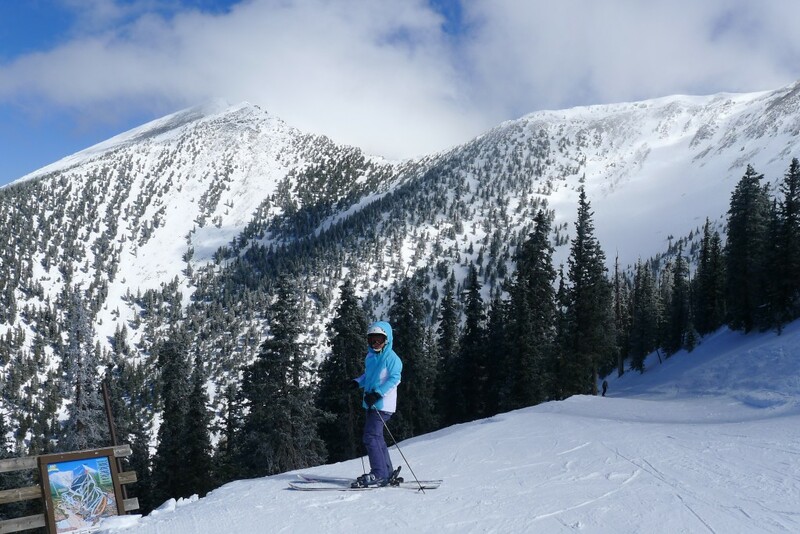 Take a run down Upper Ridge and enjoy the views on the way down. This place is a gem under the right conditions like the ones we experienced. We would love to try it again with the new lifts that were installed after we skied it. Many of the places we need to get to require a drive right past it on I-40, so this is pretty likely. 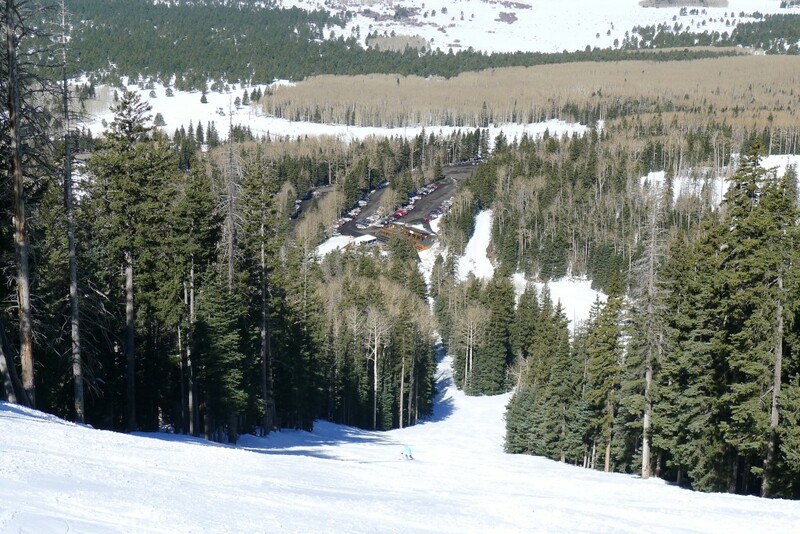 Neat project, and good write-up of AZ Snowbowl! Note, though, that your complaint about no “Upper Volcano” on the trail map is based on the 2010 map (you can see the year-by-year https://skimap.org/SkiAreas/view/548). In fact, the very last picture in the post includes a trail map with Upper Volcano. You’re right that the perspective makes the upper mountain look smaller… I personally still love the Bill C. Brown painting, but that’s a legitimate drawback. Maybe next year they’ll have the high-speed quad ready! Thanks Patrick — That skimap.org site is awesome. I didn’t know about it until now. I love the year-by-year maps. I think they must have been handing out old trail maps when we were at AZ Snowbowl for some reason. We love that place and definitely want to go back some day — especially if they put in a high-speed quad to the top!